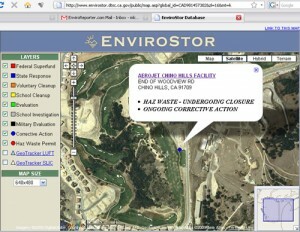 Having just debuted EnviroReporter.com Version 2, with plenty of new information about the heavily-polluted Aerojet Chino Hills site (see our 7/20/09 “Blow In Place” post), we thought we’d take a look at the Department of Toxic Substances Control website about the former Cold War-era munitions complex. We sure weren’t prepared for what we saw on four DTSC maps of the “HAZ-WASTE – UNDERGOING CLOSURE / ONGOING CORRECTIVE ACTION page. Judging from these maps, and from our observations and analysis in our EnviroReporter.com Aerojet Chino Hills cleanup plan comments, perhaps the department doesn’t even know where the former munitions test site is. All kidding aside, we hope they not only know where the site is, but also what more needs to be done to clean up the property for unrestricted use like, say, building another golf course.